The AirAsia Group has started focusing on growth at its existing portfolio of carriers after determining there is no need for additional affiliates in ASEAN and potentially in the rest of Asia. After spending the last several years actively searching for new joint venture partners, AirAsia has realised that most Asian markets where it does not yet have a local affiliate can be sufficiently covered by its existing carriers. The only possible short-term exception is India, but AirAsia remains wary of entering the Indian market and India has been the only Asian market where the group has reduced capacity over the last year. Asia’s leading low-cost carrier group will spend most of 2013 growing domestically in its five home markets and expanding international services to some strategic non-home markets, particularly mainland China. But expansion in AirAsia’s largest non-home market, Singapore, will be slowed significantly. Congestion in Singapore – more so than the saturation of Singapore’s LCC market – is prompting AirAsia to focus more on other non-home markets. The AirAsia Group currently consists of five short-haul carriers in four ASEAN countries – Malaysia, Indonesia, Thailand and the Philippines – as well as Japan. Malaysia-based long-haul LCC AirAsia X is not technically part of the AirAsia Group but works closely with its short-haul sister carriers. AirAsia in recent years has aggressively been looking at establishing new affiliates. While projects in several potential markets including Vietnam and Singapore failed to materialise, the group succeeded in launching new affiliates in Japan and the Philippines in 2012. This ended an eight-year hiatus in portfolio expansion as Indonesia AirAsia and Thai AirAsia launched back in 2004, two to three years after the original late 2001 launch in Malaysia. But the sudden expansion of the portfolio has strained the group’s resources, particularly as the AirAsia Philippines and AirAsia Japan are both off to rough starts and are unlikely to be profitable in the near-term. As a result it comes as no surprise that AirAsia Group CEO Tony Fernandes recently announced that in preparing a five-year strategic review the group decided it will slow down its portfolio expansion. Mr Fernandes said the Group will not consider any more franchises in ASEAN and that it will only do at most one additional franchise in Asia. Outside ASEAN, India and China would be of the most potential interest given they are the two largest markets in Asia. Mr Fernandes says South Korea is no longer being considered. Other new North Asian markets such as Taiwan are also likely not of interest to AirAsia given that the Group is only interested at this point in establishing new affiliates in countries that have significant domestic markets. A Chinese affiliate is more a long-term opportunity as China is not open at this point to authorising new local carriers. India became an option for AirAsia in Sep-2012, when the Indian government finally revised airline ownership restrictions to authorise foreign carriers to have stakes of up to 49% in Indian carriers. AirAsia has since been exploring opportunities in India and talking to at least one potential local partner, the Videocon Group. But AirAsia will tread carefully and will only move forward with establishing an Indian carrier as its one additional affiliate if the terms and conditions are right and if it gains confidence in the India market. The AirAsia brand has struggled to gain traction in India since the group launched its first Indian route, Kuala Lumpur-Tiruchirappli, in Dec-2008, partly because of its inability to access local distribution networks. Travel agents and online travel agents (OTAs) still account for most bookings in India but Indian agents have not supported AirAsia as Indian agents do not use the fee-for-service model. AirAsia will also not work with India’s largest OTAs due to the exclusivity of its partnership with Expedia. Having to rely on direct web sales and its Expedia joint venture has limited AirAsia’s ability to penetrate the Indian market. The AirAsia brand has entered nine Indian markets since Tiruchirappli was launched in late 2008 but has had to drop three of these markets because of unprofitability. India’s two biggest cities, Mumbai and Delhi, were dropped from the AirAsia network in 2012 as part of a route rationalisation exercise at AirAsia X.
India has been the only market in Asia which has seen a decrease in AirAsia capacity over the last year. 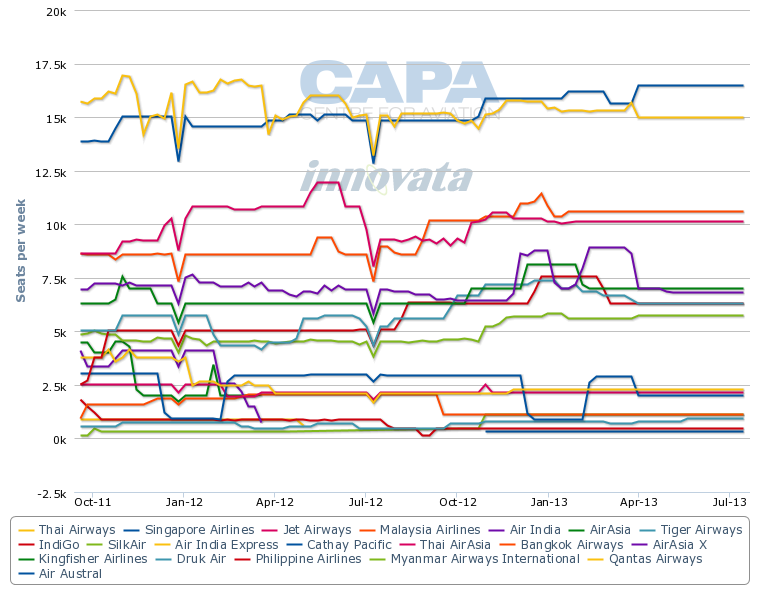 The AirAsia brand currently accounts for just about 10% of seat capacity in the India-Southeast Asia market, compared to about 14% one year ago, according to CAPA and Innovata data (see background information). AirAsia’s 19,000 weekly seats to and from India currently makes it the 12th largest foreign airline group in India – smaller than even its archrival Malaysia Airlines. Although it is the third largest aviation market in the Asia-Pacific region and one of the 10 largest markets in the world, India is now only the seventh largest non-home market for the AirAsia brand. Securing the right local partner could resolve many of the challenges AirAsia has faced in serving India from its home markets of Malaysia and Thailand. The potential long-term growth opportunities in India, particularly in Asia’s fourth largest domestic market, also continue to be of interest to Mr Fernandes. But the market remains very competitive, even after the suspension of services at Kingfisher, and unprofitable. Operating costs in India remain high compared to Southeast Asia due to high fuel taxes and high airport charges. The market fundamentals would likely need to change and/or further consolidation would likely need to occur before AirAsia pulls the trigger on a potential Indian affiliate. While India remains a possibility for a new franchise, AirAsia expects to use its existing affiliates to further grow in its other major non-home markets. Rapid growth is particularly expected in mainland China as AirAsia aims to launch several routes from its Bangkok and Kuala Lumpur hubs. AirAsia Philippines also plans to look at launching flights to mainland China once political tensions between the Philippines and China eases. The AirAsia brand is now in 11 markets in mainland China with a twelfth, Shanghai Pudong, to be added on 11-Feb-2013. Of these 12 destinations, nine are served from Kuala Lumpur (including six from AirAsia Malaysia and three from AirAsia X) and five are served from Bangkok by Thai AirAsia (two of which are also served from Kuala Lumpur). AirAsia has nearly 50,000 weekly seats into China, making it by far the largest player in the Chinese LCC international market with a 46% share. AirAsia expects to launch several additional secondary destinations in mainland China as well as leverage its existing Chinese network by launching service to Bangkok and later potentially Manila and Japanese cities from those destinations only now linked with Kuala Lumpur. Local Chinese governments have been extremely supportive of AirAsia, providing incentives which in many cases entirely offset airport costs. In many respects the Chinese international market is now more easily served from overseas than with local LCCs. As a result AirAsia is able to continue to pursue rapid growth in the mainland Chinese market without a local affiliate, which it would likely launch if the Chinese domestic market later opens up. Within the next several years China will likely surpass Singapore and become AirAsia’s largest non-home market. AirAsia is also the largest LCC brand in Hong Kong, Macau and Taiwan – giving the Group a powerful position in the Greater China market. The Group at one point looked at establishing an affiliate in Hong Kong or Macau but is now keen to focus on expanding its operations in these special administration regions of China using its existing affiliates. Further growth in Macau is contingent on the renegotiation of an attractive 10-year deal that AirAsia forged with Macau Airport when it made Macau its first destination in Greater China in 2004. AirAsia is now the second largest airline group in Macau after Air Macau, accounting for about 15% of total capacity. But AirAsia now has a bigger operation in Hong Kong and could look to focus more growth in Hong Kong depending on the outcome of negotiations in Macau. Hong Kong is still more expensive than Macau but costs in Macau have risen significantly over the last decade as Macau has developed rapidly and AirAsia is unlikely to receive the same kind of deal from Macau that it received in 2004. AirAsia may also be enticed to focus on growth in Hong Kong as rival LCC group Jetstar launches its new Hong Kong affiliate in mid 2013 with joint venture partner China Eastern. Singapore is currently by far the largest non-home market for AirAsia, with more than 40 daily return flights and over 100,000 weekly seats. The AirAsia Group has been able to steadily build up its operation in Singapore over time using initially its Thai and Indonesian affiliates and, eventually, its original Malaysian carrier after Singapore-Malaysia open skies was implemented in 2008. Philippines AirAsia became the fourth AirAsia affiliate to serve Singapore in early Jan-2013, when the new carrier launched a daily flight to Singapore from its hub at Manila's alternative airport Clark. Singapore is now the only non-home market destination served by four AirAsia affiliates. By developing Singapore as a virtual hub served by its various Southeast Asian affiliates, AirAsia has been able to capture an 8% share of the Singapore market. At one point AirAsia even had a slightly larger share of the Singapore market than Singapore-based LCC group Tiger Airways without having a local air operators’ certificate (AOC). Currently the Tiger Airways Group, which now includes Indonesia’s Mandala and Philippine carrier SEAir, is about 13% bigger than the AirAsia Group in the Singapore market while AirAsia is about 3% bigger than the Jetstar Group. AirAsia over the years has looked off and on at establishing a Singapore affiliate. Following the recent completion of its five-year strategic review, the group officially said it is no longer pursuing a potential affiliate in Singapore. But in reality the Group was never very serious about a Singapore AOC and its last attempt at exploring a potential joint venture in Singapore was back in 2011. The 2011 proposal was abandoned after AirAsia received a cold shoulder from Singaporean authorities. Singapore has been reluctant in recent years to approve the establishment of a new carrier as the market is relatively saturated and its only commercial airport, Changi, has become congested. Qantas ran into the same kind of resistance from Singapore authorities in 2011 with its RedQ project, which proposed the establishment of a new Singapore-based premium carrier that would have operated within Asia using A320s in low-density configuration. While technically Singapore is open to new AOCs, and approved with no issues in 2012 a new AOC for Singapore Airlines (SIA) long-haul low-cost subsidiary Scoot, there appears to be an unsaid rule blocking any other new AOCs. The unsaid rule could be seen as a way to protect the SIA Group but it is also easy to make the excuse that Changi is congested. Changi indeed is congested, with limited slots available at peak hours, and there are limited traffic rights to some key markets such as India. With Singapore already having six active passenger carrier AOCs – including three at the SIA Group (SIA, SilkAir and Scoot), SIA affiliate Tiger and two at the Jetstar Group (Jetstar Asia and Valuair) – the addition of a seventh and possibly eighth AOC would mean having to distribute newly available traffic rights and slots to even more local carriers. Recognising the saturation of Singapore’s short-haul LCC market, the Singapore AirAsia proposal envisioned primarily operating medium-haul flights to China and India. This was logical in that it avoided overlap with AirAsia’s existing affiliates, which currently only serve Singapore from other Southeast Asian countries. Singapore is Indonesia AirAsia’s biggest market and the Group’s Indonesian partner would prefer not to share the market with the proposed Singapore AirAsia, which had lined up a local Singaporean owner for the required majority 51% stake. Bangkok-Singapore is also the largest international route for Thai AirAsia while Kuala Lumpur-Singapore is the largest international route for AirAsia Malaysia. But the proposal was illogical in that it would have required the AirAsia Group to break from its focus on routes of four hours or less. AirAsia has discovered that it is nearly impossible to profit on medium-haul routes with its 180-seat A320s given the higher cost of fuel on longer flights. AirAsia interestingly made this point in announcing its decision in Jan-2013, as part of its recently completed five-year strategic review, to no longer consider establishing an affiliate in Singapore. AirAsia’s pursuit of a Singaporean AOC was likely simply an attempt to see if the Singaporean authorities would be willing to entertain Mr Fernandes, who has had a rocky love-hate kind of relationship with Singapore for the last decade. Even if Singapore AirAsia had received the green light, AirAsia’s management team and board would have almost certainly decided against moving forward with the project. AirAsia already has the Singapore-Southeast Asia market sufficiently covered to make it worthwhile to divert the resources to establish an affiliate in the already crowded Singaporean market. Focusing on India and China is good in theory but in reality would have been challenging. The Singapore-China market has huge potential, which AirAsia rivals Jetstar Asia and Tiger have been able to tap. Singapore enjoys open skies with China, although access to major cities is difficult due to slot restrictions. But most of China is at least four hours flying time from Singapore. AirAsia is now instead looking to target the Singapore-China market, particularly inbound demand to Singapore from secondary cities in China, by offering connections through its Bangkok hub. AirAsia believes it can serve several points in mainland China from Bangkok which would not be viable for a LCC from Singapore given the longer length of flight from Singapore. The group currently does not have a connecting product at its Bangkok hub, which moved late last year from Suvarnabhumi to the old Don Mueang Airport, but plans to develop one during 2013. AirAsia already has a connection product in Kuala Lumpur and transit passengers now account for about 30% of AirAsia's traffic on the Singapore-Kuala Lumpur route. AirAsia believes it can grow traffic on the highly competitive Singapore-Bangkok market by starting to offer connections in Bangkok with a focus on mainland China. But the group for now is not planning to add significant capacity on Singapore-Bangkok or other existing Singapore routes as its focus for now is on improving load factors in Singapore, which have been in 75% to 80% range (slightly below AirAsia Group averages). Singapore-India also has huge potential, but is limited particularly for Singaporean carriers due to bilateral restrictions. 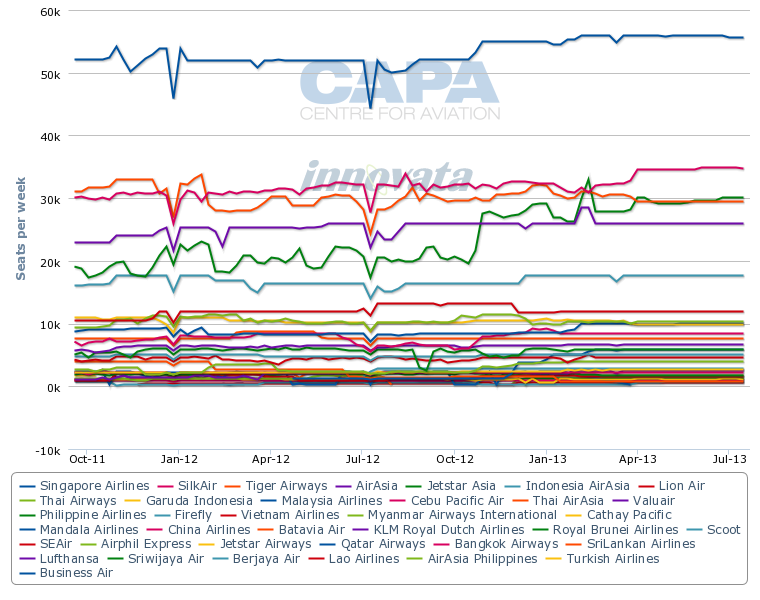 LCCs have also struggled in the Singapore-India market, particularly to northern India. IndiGo, for example, recently decided to drop services to Singapore from Delhi and Mumbai. The Singapore-Southeast Asia market is generally open but LCCs already account for over 50% of capacity in this market, compared to only about 11% in the Singapore-China market and about 25% in the Singapore-India market. AirAsia is also able to continue to expand in the Singapore-Southeast Asia market using its existing affiliates. The AirAsia Group now has about an 18% share of the Singapore-Southeast Asia market, making it the largest LCC brand in the market. The Tiger and Jetstar groups each have about a 13% share of capacity in the Singapore-Southeast Asia market. AirAsia is keen to maintain its leading share among LCCs of the Singapore-Southeast Asia market by adding capacity from its existing four home markets in ASEAN, particularly Indonesia, and launching new routes to non-home markets. Indonesia AirAsia is launching four weekly flights on 07-Feb-2013 between Singapore and Semarang, which will give the Indonesian carrier five destinations from Singapore. But AirAsia is unlikely to expand significantly in Singapore in the short to medium term as the group is now struggling to secure approvals for new routes and slots. Changi has become selective providing carriers with additional slots except during late morning, early afternoon and overnight hours. Takeoff queues have increased significantly in recent years during the morning and late afternoon/evening peak, frustrating carriers, particularly LCCs. AirAsia has had to increase block times on peak hour Singapore flights as well as turnaround times from its standard 25min to between 30 and 40min. Given the size of the AirAsia Group’s Singapore operation, the wasted time spent due to ATC congestion is the equivalent of not being able to utilise one aircraft every day. The inability to quickly turn around aircraft is a huge deterrent for cost-focused AirAsia and has become a factor when AirAsia looks at adding more capacity at Changi. Changi Airport also has not yet approved Thai AirAsia and Indonesia AirAsia requests to base aircraft in Singapore, which would open up new early morning departures to its Bangkok and Jakarta hubs. AirAsia Malaysia began basing one aircraft and crews in Singapore in late 2011 but a lack of parking spots at Changi has blocked the planned opening of one-aircraft bases for Indonesia AirAsia and Thai AirAsia. This has inhibited growth as AirAsia intended to use the two additional Changi-based aircraft to open new flights. It also has limited the efficiency of the existing base as it is currently limited to just one aircraft. AirAsia also has been frustrated with attempts to secure route authorisations from Singaporean authorities. Indonesia AirAsia for several months has been trying to secure permission to serve Singapore from Medan and Surabaya while AirAsia Malaysia has sought permission to launch a Kuala Lumpur-Singapore-Yangon service. But Singapore authorities have sat on all three applications, which have been approved by the required authorities in Indonesia, Malaysia and Myanmar. AirAsia in theory should be able to operate the two new Indonesian routes as there is room in the Indonesia-Singapore bilateral for Medan and Surabaya. But Singapore has not yet moved on these applications from Indonesia AirAsia while approving Mandala to launch the same two routes although there is room in the bilateral for both carriers. Mandala is affiliated with Singapore-based Tiger but uses Indonesian carrier rights as it is majority Indonesian-owned. The poposed Kuala Lumpur-Singapore-Yangon route should also technically be allowed as Southeast Asian carriers are now free to open fifth freedom routes between capital cities of the eight countries that have signed onto the ASEAN Multilateral Agreement on Air Services. Singapore, Malaysia and Myanmar have all agreed to the Multilateral Agreement, which is already in effect, as only Indonesia and the Philippines have so far not joined the pact. But Singapore appears to be sitting on this application because it sees it as a backdoor attempt to operate a seventh freedom route, which isn’t allowed under the ASEAN agreement, because Kuala Lumpur-Singapore-Yangon is not a straight route and involves backtracking. But technically there are no stipulations in the ASEAN Multilateral Agreement that excludes non-straight routes or requires that airlines allocate a majority of seats to passengers that stay with the flight for both sectors. As AirAsia has decided against pursuing affiliates in Brunei, Cambodia, Laos, Myanmar and Vietnam, the Group will be unable to launch flights between Singapore and these countries if it is unable to find a way to use the fifth freedom capital-to-capital rights available under the ASEAN Multilateral Agreement. Cambodia, Vietnam and Myanmar are currently served from Singapore by AirAsia rival Jetstar Asia while Cambodia and Vietnam is also served by Tiger. Seventh freedom rights will also not be allowed under ASEAN open skies, when the full agreement gets implemented in 2015, limiting AirAsia’s ability to serve non-home markets from its Singapore virtual hub unless it is able to get around the current holdup and persuade Singaporean authorities to give it fifth freedom rights. AirAsia now sees the markets in Brunei, Cambodia, Laos, Myanmar and Vietnam as too small to justify establishing its own affiliate. With these five markets already covered by its other affiliates, there is limited room for a new affiliate, as is in the case with Singapore. AirAsia previously had an agreement to establish an affiliate in Vietnam, which after Singapore is the largest of the six markets in ASEAN that the group currently does not have a local affiliate. But the deal was dropped after the new joint venture carrier, which originally was known as VietJet AirAsia, was unable to secure Vietnamese permission to use the AirAsia brand. The Vietnamese partners went ahead and launched the carrier in Dec-2011 without AirAsia investment and the AirAsia brand. VietJet has quickly grown to become Vietnam’s largest LCC, overtaking Jetstar Pacific. There is potential for rapid LCC growth in Vietnam but AirAsia sees the market as too crowded and not able to support a third LCC. VietJet is still open to the idea of securing investment from a foreign LCC to support further expansion but AirAsia is generally not attracted to investing in an existing carrier and prefers to establish new affiliates from scratch. Mr Fernandes now believes having carriers in four ASEAN markets is sufficient, particularly as the four ASEAN countries that now have AirAsia affiliates are the four largest domestic markets in the region. He calls Brunei, Cambodia, Laos, Myanmar and Vietnam attractive but believes it is best to focus on the four existing ASEAN markets as they “offer bigger domestic alternatives with larger populations”. AirAsia is now focused on building up its domestic operations in Indonesia, Malaysia, Thailand, the Philippines and Japan. AirAsia Malaysia is adding 10 A320s in 2013 as the carrier looks to build up its domestic operation ahead of the launch of new Malaysian LCC Malindo. Thai AirAsia will add nine A320s, with a focus on increasing competition against Thai Airways LCC affiliate Nok Air. Indonesia AirAsia, which is also slated to add nine A320s in 2013, is currently primarily an international operator but is mounting new domestic expansion as it aims to capture a portion of a LCC market now dominated by Lion Air with rapid growth also from Garuda subsidiary Citilink. While it has 361 additional A320/A320neos on order, there is sufficient growth in AirAsia Group’s five existing markets to soak up all of these aircraft without requiring the launch of an additional affiliate. If Indonesia, Thailand, the Philippines and Japan simply replicate over the decade the growth seen over the last decade at AirAsia Malaysia, which now operates about 65 of the group’s 114 A320s, there is no need to launch another affiliate. Malaysia is a much smaller market than Indonesia and Japan, is slightly smaller than Thailand and is only slightly bigger than the Philippines. An additional affiliate would drain resources and distract the group as it is trying to raise the profitability of Indonesia AirAsia and Thai AirAsia to AirAsia Malaysia’s industry-leading levels and to put newer AirAsia Philippines and AirAsia Japan on a firm footing for a sustainable future. India given its humongous size is appealing but could prove to be an unprofitable distraction and challenge. China for now is off-limits but AirAsia will continue to build its status as the largest foreign LCC and will be ready to enter the world’s second largest domestic market if and when the regulatory environment changes. In its extended home market of ASEAN the Group needs to focus on building up its position in Indonesia, Malaysia, Thailand and the Philippines as competition intensifies, particularly from Lion Air. The rest of Southeast Asia, including in the crowded and congested Singapore market, can be adequately covered without having to take on the costs and risk associated with a new affiliate.